Sometimes we get wild and crazy creative briefs. This Sheep Of The Year Awards is no exception! As ever, we cast individual animals who are best suited to the various roles and then carefully prepare and rehearse them for the shoot. Simples. This is a viral we did for Finisterre, makers of world beating surf and outerwear. Shot in Cornwall in a single afternoon. A post-apocalyptical Stonehenge sits just below Boris’s Office with the Tower of London watching over. 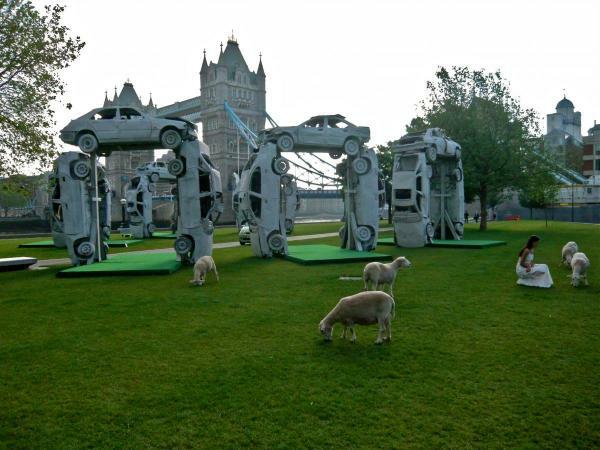 Here amid the sights and sounds of the City of London some sheep gently graze, blissfully unaware of the concerns of government, the financial establishment, the euro and the Olympics London 2012. When something has to happen calmly, safely and securely, clients come to A-Z Animals. A-Z Animals provides and expertly supervises animals for film, television, advertising, PR and special events. A couple of weeks ago I was working late in the office, catching up on paperwork after several weeks of location shoots, when my Mac went ping! A late night email in from NYC asking might A-Z Animals be able to provide an interesting animal with Lady Gaga for her upcoming appearance on ITV1’s Jonathan Ross Show. Several exchanged emails later I decide, this indeed is an interesting project and one that I would take great pleasure in seeing going really smoothly. The kind of project that requires everything to be thought through to the Nth degree. Just our kind of job. I enquire might LG consider a Jacobs Ram? A day later an email arrives saying LG loves the Jacobs Ram idea. Just the job for “Kevin” then! As it turned out, Lady Gaga and Kevin the Jacobs Ram got on like a house on fire. The key to it all going well of course was Kevin’s wonderful temperament. As we say to clients when A-Z Animals provides and supervises animals for filming, photography and special events, excellent preparation and the suitability of the particular animal(s) is everything. Kevin the Jacobs Ram was a real star!